Wigan remain joint-bottom of the table on zero points after the shock of the Super League so far. An appeal against their points deduction for breaking the salary cap will be heard tomorrow. The fact the champions went down to the newly-promoted Broncos adds weight to the marketing boast that 'anyone can beat anyone'. This was the fourth loss in five matches for the Warriors - and that statistic is an easy stick to beat them with. But in truth, it is the fact they have performed so poorly in successive matches which is most disappointing. Like the previous week's loss to Hull FC, they matched the victors for tries and - like the loss to Hull FC - Wigan didn't deserve to win. They reversed their trend of starting slowly and improving. This time, they went into a 10-0 lead and then collapsed, trailing 12-10 at half-time. Tony Clubb's try on the hour gave them hope but, as Adrian Lam pointed out, senior players made too many errors and the backs failed to conjure attacks which troubled the robust home defence. Kieran Dixon's long-range try early in the second-half proved the turning point. He scooped up a ball and raced away to make it 16-10 (see video, inset) - and later added a penalty to open up an eight point gap. "It was a 12 point turnaround, I think it was a five on two and we didn't get it right," said Lam. "(Morgan) Escare dropped the ball and Dixon picked it up and went 100m." In hindsight, George Williams may have been better stepping the defender and powering for the line, rather than launch a long pass to Escare, who was filling in on the wing after Liam Marshall withdrew the day before the game through illness. But even so, at that stage, the Warriors still had more than enough time to get themselves back into it. Wigan were missing nine players who would have had claims to have played but - and this is going in capital letters to emphasise this point - NO ONE IS USING THAT AS AN EXCUSE. Yes, their list of absentees included wingers Joe Burgess and Dom Manfredi, forwards Joe Greenwood and Liam Farrell, props Ben Flower and Gabe Hamlin - as well as three players who would have been 'next in line' - and yes, that probably had an impact on the fluidity of their play. 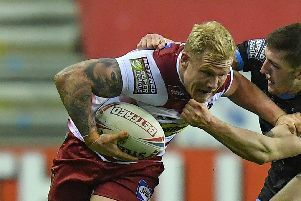 But with nine full or former internationals in their ranks, Wigan had more than enough firepower to have got the job done against a team comprised mainly of players who were in the Championship last season. Of the Warriors players, it was a non-Test player - Joe Bullock - who stood out the most with some metre-chewing drives. Lam was happy with the contribution of all of his middles. There's a sense that London, as a club, are still discovering teething problems since their return to Super League. But there is a warmth and charm to their tiny, tidy Trailfinders Sports Ground home. Most of the fans sit in stands behind the sticks and, this being a rugby union ground, the hospitality was good - IPA on tap, Lavazza coffee and a fish n' chips stand. On the pitch, too, they have players who work hard for each other and in homegrown full-back Alex Walker a real gem of a player. Their ambitions are realistic - Danny Ward says he needs his players to all perform at eight or nine out of 10 each week to win at this level. But they certainly deserved this victory, which will be spoken about by their fans for a long time to come. Good luck to them for the rest of the season.